If you’re like me, you connect your Time Machine backup disk every time you’re at your desk. You know you should unmount that drive when it’s time to hit the road, but opening the Finder just to hit “Eject” feels like a waste of time. Enter Semulov. This lightweight, open source application adds an “Eject” button to your Mac’s menu bar, so you can unmount any drive in just two clicks. You can even create a universal keyboard shortcut to unmount every drive connected to your computer, saving you from having to open the Finder and unmount everything individually. To get started, download Semulov. The application comes in a ZIP file which you can unarchive by opening. Then, drag the icon to your Applications folder. Start Semulov and you’ll see an Eject button in your menu bar. It looks just like the Eject button used back when Macs had optical drives and dinosaurs roamed the earth. Click the icon and you’ll see a list of currently connected external drives; click a drive to unmount it. You’ll see a notification when the drive is ready to disconnect. You can open drives by holding Option and clicking the drive; more on that later. This application really doesn’t need to be more complicated than this, and for most users this is enough. But there’s a bit more power if you dig into the settings, which you can find by clicking the menu bar icon and heading to Semulov > Preferences. A window will pop up with various options, the first of which is whether Semulov should start up when your mac does. Customize the menu bar icon, allowing it to show how many drives are currently mounted. Decide whether your startup disk should be listed. You can’t unmount your start up disk, so this would be purely informational. Add an “Eject All” button, and even define a keyboard shortcut for unmounting all drives. “Show Unmounted Volumes” does exactly what it says, allowing you to mount such drives simply by clicking them. Change whether clicking a drive unmounts it or opens the drive in Finder. Check this option and holding Option while clicking will eject the drive. Below these options you’ll find a few more. 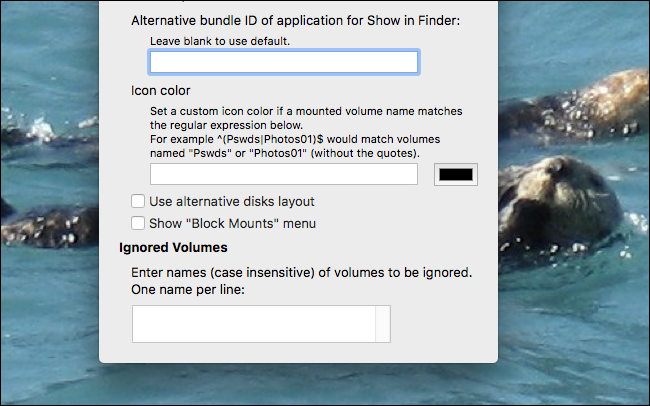 If you use a file browser besides Finder, you can specify an alternative application using the bundle ID. You can also set custom icons using regular expressions. The “Alternative disk layout” ignores names set by users in favor of the manufacturer’s name for a drive, and shows the relationship between partitions. The “Block mounts” option adds a button that temporarily prevents drives from being mounted. Finally, you can enter a few names of drives for the application to completely ignore. For most users these features are overkill, but we like having the option to customize this tool just a little bit more.